If I was to buy a steel pan for a friend who’s a beginner, I’d go for Panyard Jumbie Jam steel pan drum. This quality made kit is perfect for beginners because it’s the best steel pan that can be found at this affordable price. It comes with a songbook that will make the learning easy and enjoyable. When it comes to learning an instrument, in this case, a steel pan drum, some say that every instrument is good, to begin with. In a way, it’s true, but some instruments are better than the others. So, why to buy any instrument for beginners, when you can get the best one? That’s why I want to introduce you to the best steel pan drums for beginners available. I’ll make brief but detailed reviews, comparing the price with the quality of the sound and craftsmanship, including extra features and tools. So you’ve heard a Caribbean tune played on a steel pan drum and you want to get one as soon as possible, which is awesome. But most of the beginners have no real knowledge of what to choose, at least I didn’t. That’s why I want to show you my choices for best steel pan drums for beginners out there, for both kids and adults and explain what you will get for the money you pay. 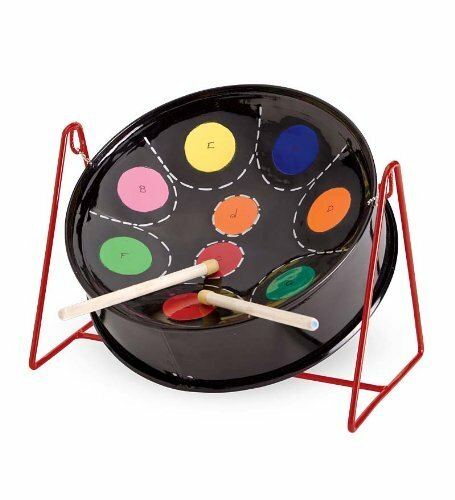 This is actually the go-to steel pan drum that I show to everyone that wants to get into playing this instrument. Awarded by the National Association of Music Merchants, this steel drum comes with a neat collapsible tabletop stand and mallets. There’s also a practical beginner’s songbook for quick and easy learning. Every member of the family can enjoy playing it. The drum is quite lightweight and compact (19.4 x 17.1 x 3.4). It’s great you need to store it for a while or take it somewhere. You’ll get a hip carrying case with it too. The notes marked on it, A, B, C, D, E, F, F#, G, sound clean and well-tuned and provide that mellow island sound. I always praise it since it’s really the best product in this price range. Basically, a steel pan drum perfect for every beginner, affordable, quality made, practical and atop of it all, designed to both look good and be a joy to play. Coming in close second is another Panyard steel drum instrument by the name of Jumbie Jam. It also comes with a neat and practical carrying case, mallets and a songbook, making it easy to transport, store and learn. But it also comes with a full-size stand and a play-along CD, you don’t even need to know how to read notes. Panyard showed another great example of simple design, durability and user experience since everyone can learn to play quickly and easily. Besides a recreational and learning tool at home, it’s often found in music workshops and schools. It reaped two awards from the National Association of Music Merchants, one being “Best in Show” and the other “Best Tools for Schools” in 2010. The only reason why this steel drum instrument is not the #1 on my list is its price. Don’t get me wrong, the price is still really affordable, but I wanted to go with the best price and quality ratio. Skipping to another great handmade Caribbean steel drum pan in a mini version. Kids will have a blast learning it and being compact, makes this drum a great space saver. 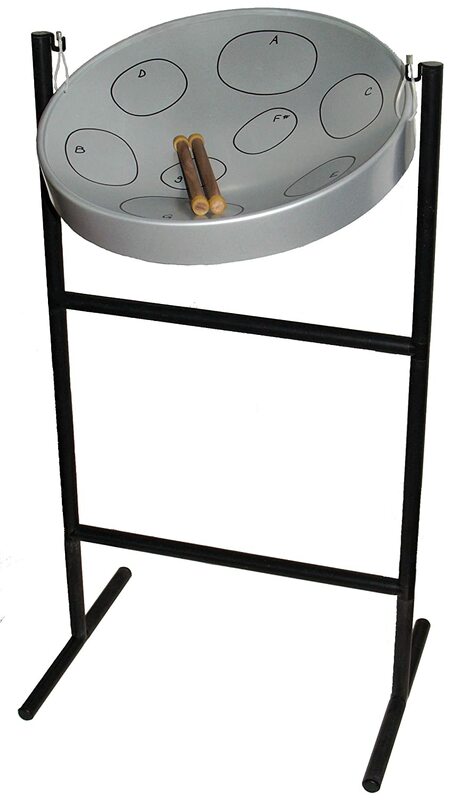 Mini steel drum (12.5 x 3) comes with a lightweight PVC stand that can be easily assembled. Similar to the first two pans, every new steel pan enthusiast will get a free play-along DVD and a music booklet. Classic beginner tunes like Jingle Bells, Happy Birthday, London Bridge, This Old Man, Oh When the Saints Go Marching In, Twinkle Twinkle Little Star, and Amazing Grace could be learned in no time with it. 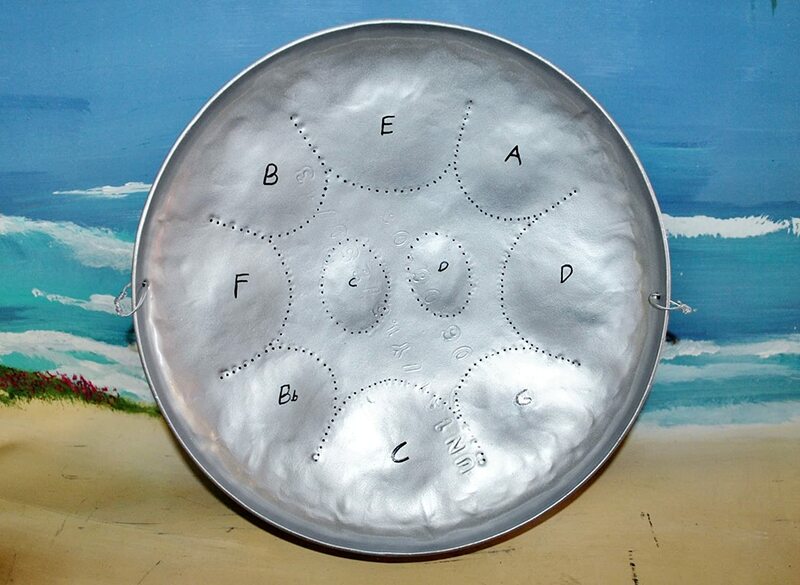 With 12 marked notes, this steel pan instrument provides more than enough sounds for a soon to be pannist. 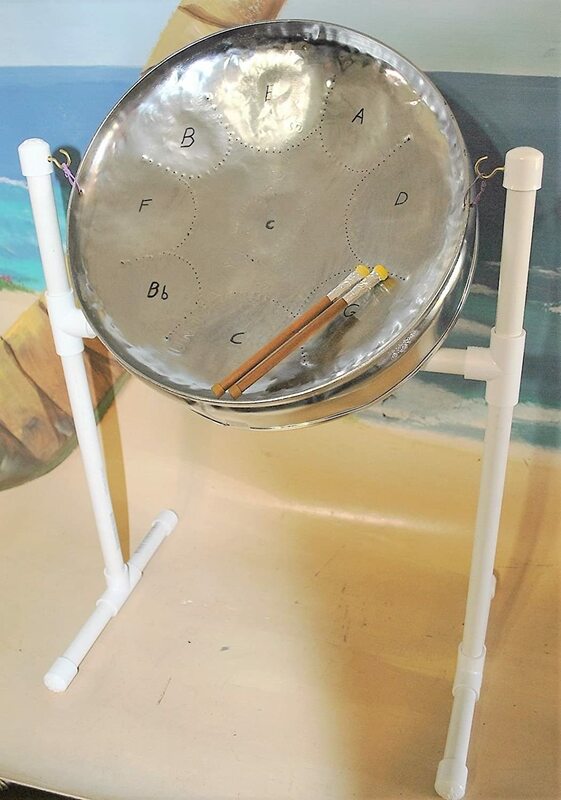 Steel Drum Source on the list again with a bit larger steel drum instrument (14×3). With 9 notes in C Major Scale, you will be able to play more than enough beginner’s songs to learn the trade. The package that comes with it is similar to other drums: 2 standard wooden sticks, lightweight PVC stand and a FREE play-along DVD with music booklet. The metal is carefully shaped to be in tune and produce the notes as accurate and clean as possible. Booklet and the DVD are really easy to understand and you will learn to play tunes like Jingle Bells, Happy Birthday, London Bridges, This Old Man, Oh When the Saints Go Marching In, Twinkle Twinkle Little Star, and Amazing Grace faster than you think. Finishing the list with the most affordable steel pan instrument – a tabletop 11”x1/2” Mini C black drum. It’s an amazing introductory pan for kids older than 3 years and even adults. Made in Trinidad and Tobago, the country that is the home of the steel pan music itself. It includes a small red stand, two wooden drumsticks, and an instructional songbook. 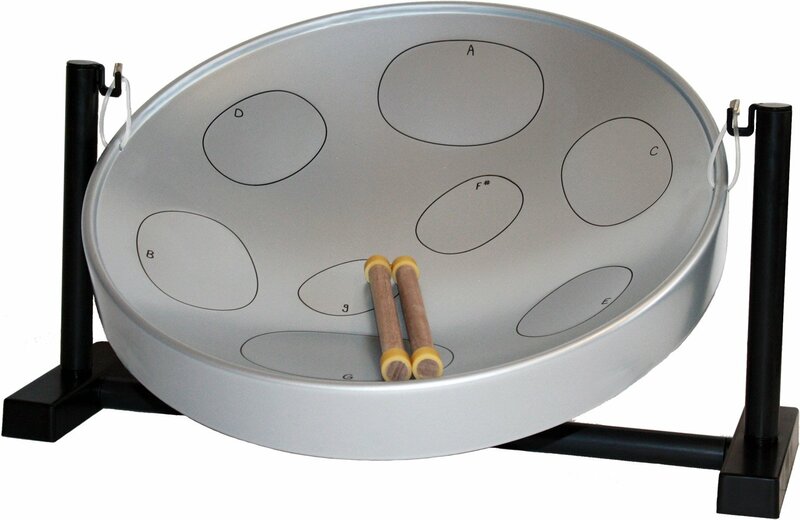 This steel pan would be a great birthday present for kids, inspiring them to be more creative at the same time. The 9 C Major notes, more than enough for starters, are marked with different colors, giving it a fun colorful look. Wonder why I didn’t mention some high-level pans? The thing is, if you are starting to learn a steel pan instrument, you don’t want to overpay the first one unless you are 100% sure that you want the professional pan. Their price can easily go up to 1000$ and over. But not only that, they are a lot more complicated to play and you could be overwhelmed by it, therefore losing the motivation. These beginner drums are way cheaper and you can still play a variety of songs even with one octave. More importantly, most of them have guides that will teach you how to play steel pan drum in no time. Even if you give up, which I hope you will not, you don’t lose much and at least you can know that you tried. I really hope this will help you narrow the choice down. Once again, I would strongly recommend you the first drum if you want to get the best for your price. However, whichever steel pan drum you choose from this list you will not regret it.